L'oreal Infallible in Endless Pearl... this is a great highlight that actually has very little shimmer. It's great to soften the edges of other colors. 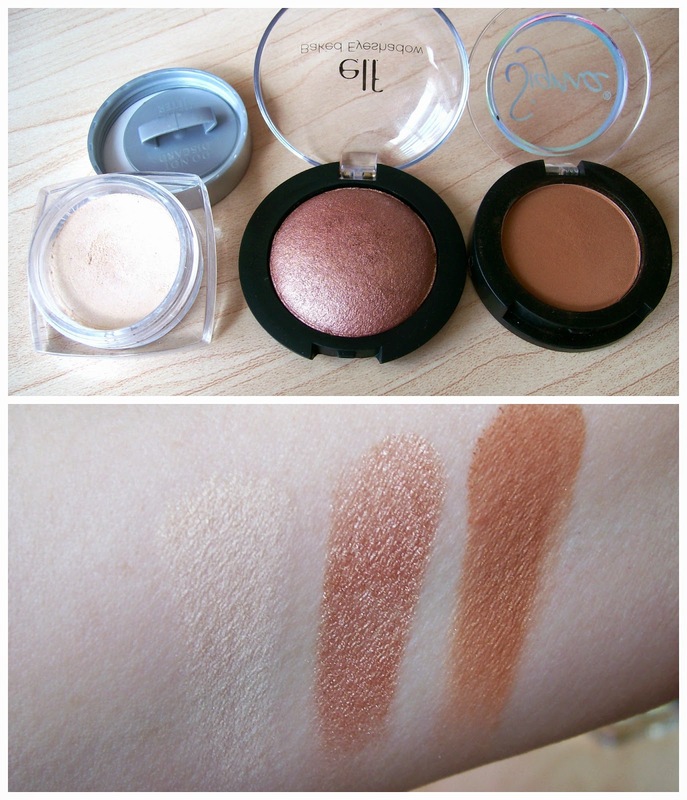 ELF Baked Eyeshadow in Toasted... I randomly swatched this during a review for a different product earlier this week and was reminded of how pretty this rose gold is. Sigma Eyeshadow in Topaz... This was totally one of my colors of the summer last year! I love this warm, matte brown. It's so pretty sheered out just above a deeper shade in your crease. Gorgeous! Sephora Outrageous Prisma Chrome in Outrageous Metallic Taupe... A deeper, more grey-ish taupe than Midnight Brown. I remember getting several shadows of this kind in a big sale last year. Sigma Eyeshadow in Hitch... A cool, dark matte brown. I thought it'd be great used alongside any other shadow I pulled from my collection. Estee Lauder Pure Color Shadow in Pop Pistachio... This shade just screams SPRING to me! It's so beautiful. I'd love to pop this on my lid or on my lower lashline. Sally Girl Shadow in Lilac... Maybe it's because I've been drooling over lilac nurseries on Pinterest, but I was just drawn to this shade when I saw it in my drawer. Mally Effortless Airbrush Shadow in Sugarplum... I love how this purple is somewhat deep- but still really has that purple pop on your eyes (sometimes plums don't show their color as much once you blend them out). I had forgotten how amazing this formula is. The shadow actually feels the slightest bit spongy! Burberry Eyeshadow in Mulberry... The second of my beautiful Burberry shadows! When I look at this color, I see some plum AND burgundy. It makes a gorgeous smokey eye! So that wraps up my latest round of stash shopping! Is there anything in your collection that's not getting the attention it deserves? I'm so sorry I had to miss Beauty Broadcast Live yesterday! I realized at the last minute that I had a dentist appointment scheduled for that day. I do have the sweetest hygienist on the planet (plus she flosses with such painless speed!) but I still really missed getting to chat with the #bblive gang! I hope everyone has a great Easter weekend! Any fun plans? It'll be pretty low-key on our end... we had family down a weekend early. Wish they were all still here! I have a new Get Ready with Me video all finished up & ready to upload! I plan to get that posted tomorrow. I forgot to do my "bumpdate" on Instagram this week! On Wednesday I hit 18 weeks! I believe I've felt some little movements over the past couple of days!! It's awesome. It feels like little flutters, and if I'm laying really still, I can definitely notice them. So cool! You are definitely the cutest pregnant woman ever. Love these bump updates! I love my baked elf eye shadows. I have one in a deep purple. I have to remind myself to use it as well! love your blog and videos! they are graet! 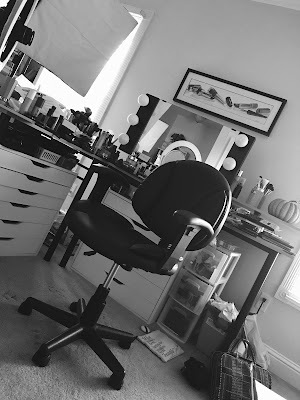 I wish we had in israel all the brands you are showing... can you recomend on website that sales NYX prodacts? I love the idea of shopping your stash, and it's nice to pull out a bunch of single shadows because usually they get lost in the shuffle! Thanks for the inspiration to go hunting in my drawers! You and your bump are looking super cute. Have a great Easter weekend! Adorable bump pic! Also Target has some really cute lilac stuff for nursery decor! We did my daughter's nursery in lilac! This makes me really want to go through my single shadows! 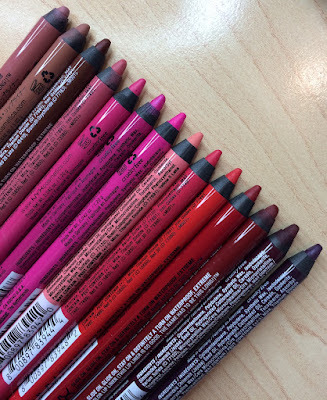 I've been favoring exploring color through lip products recently (something I NEVER thought I would do - I used to tend to "eat" off my lip color accidentially), so I've been neglecting the single shadow scene. I have one in mind specifically that I want to use... Wet n' Wild's Nutty. Come to mama. Speaking of "mama," I love hearing about your pregnancy updates! Are you and Tyler still thrilled and excited every day, or do you guys consider it old news at this point? I also have trouble evading my palettes, but I was wondering if you're still planning on doing a review of the Narsissist palette (sorry this is totally the wrong post to be asking on, but it reminded me)? I bought the ELF baked shadow in Toasted back in January. Found it on clearance at a Target and decided to get it since I didn't have any of those shadows. I love it! I do the same thing wit my single eye shadows. I like the palettes because everything is in one place. I have to start going through what I don't want and get rid of them. Love the baby bump. You are glowing. So happy for you. Happy Easter!!! That L'OREAL shadow in Endless Pearl looks so nice. I always eye that in the store but I have never picked it up. I might have to now. That Lilac one from Sally Girl looks nice too! Thanks for the awesome post. I often chew on ice while I lay down so my little one moves! Gives me the warm and fuzzies! If you want to go big and get another Burberry eyeshadow, Rosewood is so gorgeous! I always go to the Burberry counter at the mall and swatch it longingly. One day it's gonna happen. You know I always forget about my single eyeshadows and smaller palettes! OHHH that ELF eyeshadow looks good. My dad's letting get some ELF makeup because of the sale going on right now and I think I'm pushing it at $55.95 :l oops :D! Speaking of babies...My cat, Wisp, gave birth to 5 kittens, but sadly, the fifth one was a stillborn (not to sound like a downer). Loved this post!! You've now inspired me to go through my collection of shadows too! :) thanks for the inspiration!! :D and love your baby bump, you look so cute!! Wait till the 7th month and you are laying in the tub and you watch a foot protrude from one side..very Alien-esque. You are absolutely glowing! Might be the makeup like you say on #bblive but you are still glowing. 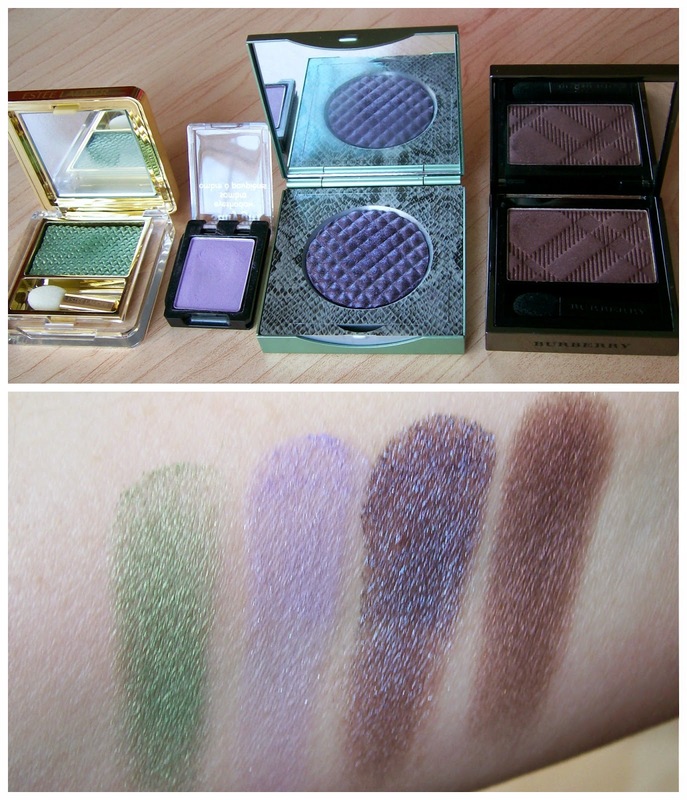 I love that Estee Lauder Green and the Burberry one in mulberry. This is so not meant to be a plug in but this is so weird I have to share, I also did a shop my stash blog post this week. They say great minds think alike!!!! I am glad to be thinking like you, now you may not be so proud to be thinking like me.....LOL! Lol I saw the Burberry shade and I'm llike "Wow thats a Kristen Gehm color!" I wonder why! I'm not that palette fan anyway and I usualy like using single colors as I feel I have the freedom of choosing my own combination. The deeper shades look so lovely. The split in front is really above the knee and fitted, so don't think about amending it . I thought I would have to amend a part of the dress, but its perfect and needs no amendment anywhere. Lay on your tummy, helps to feel those early flutters better. Plus you won't be able to lay that way for a long time so enjoy it while you can. Singles used to be a serious issue for me.. until I depotted them all and made palettes out of them. They get way more love now. Great post! I've been so obsessed with a couple of palettes that my smaller quads and singles have barely been used. >.< Definitely going to pick up that L'Oréal infallible shade. I love the one I have in Amber rush. So happy for you! You look beautiful! I can't believe how fast the time is going. 18 weeks and I just watched your 16wks video anouncing the gender of your baby. You look absutely stunning. So excited for you & Tyler. 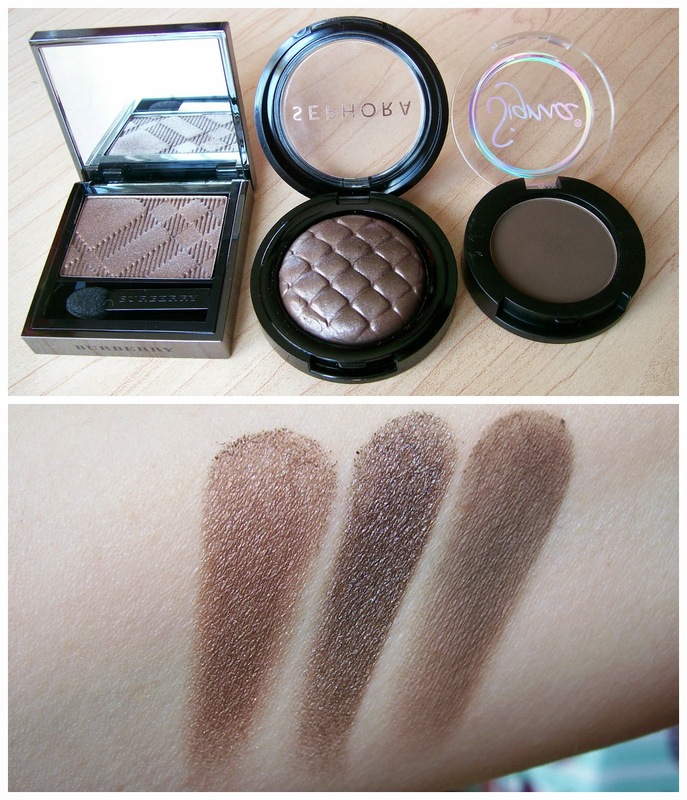 I need to get my hands on one of the deep brown shadows by Burberry. I've neved seen such a rich brown like this in any eyeshadows I have in my collection. Beautiful shades. I love toasted and that Sally Girl shade looks beautiful. I'm not even pregnant or thinking about it anytime soon (I'm not even in college yet! ), but I also love lavender in nurseries! Your little bump is so cute! I always forget to use my single shadows, especially since I have so many new palettes to start using now. With so many choices, it's hard to pick what to use! The shades are ALL beautiful! I love how you're tippy toeing! So damn cute! I have been doing shop my stash for a while now. I have been loving hard candy eyeshadow duos high maintenance, rush hour, Covergirl single in Mink & Wet & Wild comfort zone palette. Also loving the bump updates! Congrats again! Beautiful! First upon congrats for the good news. These days are very special for everyone, especially for a mother that she wants and make it more beautiful as you are doing now. Nice idea of clicking such a great pics. Keep sharing!! I love the Sephora Outrageous Prisma Chrome shadows! Beige is gorgeous! You look great with your little bump! Thanks for sharing this very personal time with your readers/subscribers! :) Congratulations! I have never bought single shadows, but the deeper neutrals are so good. Thanks for sharing! LOVE the Sephora Outrageous Prisma Chrome in Outrageous Metallic Taupe, so pretty! But, it's not on the Sephora website, do you have a dupe you can suggest? Thank you for sharing all your tips! Cute baby bump pic, love how your shirt and your phone case matches too! I love the elf shadow! It looks so pigmented. Yes, it's coll to feel the baby, I'm on the 26th week and it moves much more now :), I think I will miss that feeling when it's born. Awww, Em! Your baby bump is so cute<3 You are definitely glowing! This is my first time seeing your blog after seeing your youtube videos for a couple years now. I had no idea you were expecting!! What a cute lil' baby bump!